Universal standard unit. 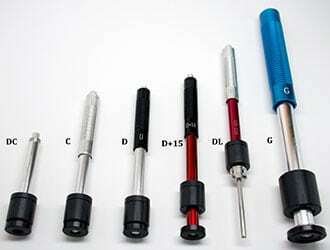 Will handle the majority of hardness testing applications. Note: Impact device D is standard device on all models. Specification is identical. Very narrow contact area with a set back measurement coil. This device is used to measure hardness in grooves and recessed surfaces. This model features a needle front section with a diameter of 4mm and a length of 50mm. It is suitable for testing in extremely confined spaces, the base of grooves and on special components such as as gear wheels. For use on steel and cast steel only! Very short impact device for those confined areas, i.e. inside bores for internal measurements. Conforms to the D measuring range. This device has an enlarged test tip, and an increased impact energy range (approx. 9 times the D, 72 ft-lb.). Can be used on lower quality finishes for measuring hardness in the Brinell range only (max. 650 HB). Designed to be used with heavy components such as heavy castings and forgings. A reduced impact energy impact device (approximately ¼ of the D Type 2 ft-lb.) for measuring the hardness of surface hardened components, coatings, thin wall or impact sensitive components. Applies a small superficial indentation.